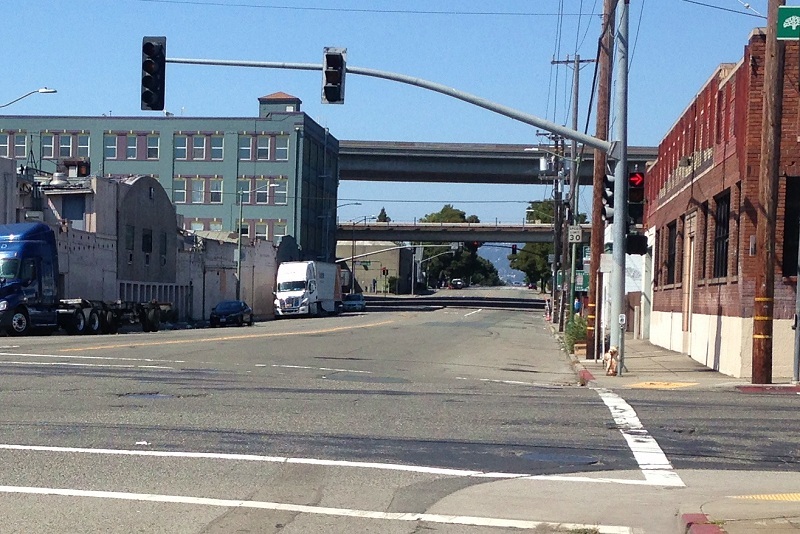 Down at the foot of Adeline Street, past Green Valley Food, past J. K’s Brickhouse, past Magnolia Oakland at 3rd Street, the road ends at the old shoreline. Where the Amtraks roll by was once coastal marsh. 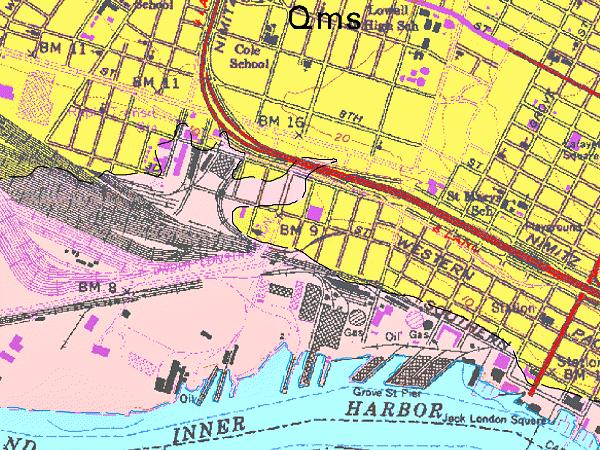 The geologic map uses an old pre-earthquake topographic base, so ignore the freeway and find Adeline, running through the “m” in Qms. The Qms refers to the Merritt Sand, the field of ancient sand dunes, once covered with oak forest, where the city of Oakland first took root. If you stand at 3rd Street and look north past the 5th Street Lofts, the BART tracks and the 880 freeway, you’ll see the land lift as the road leads into West Oakland. A benchmark on this spot has an elevation of 9 feet above sea level. Between here and 5th Street was once a small arm of the Bay, long since filled in. Another benchmark on 7th Street is at 16 feet, and just north the ground goes above 20 feet. The Merritt Sand dunefield is very level. Its highest point is roughly under City Hall, at an elevation a little over 40 feet. This entry was posted on 5 June 2017 at 8:03 am and is filed under Other topics. You can follow any responses to this entry through the RSS 2.0 feed. You can skip to the end and leave a response. Pinging is currently not allowed.